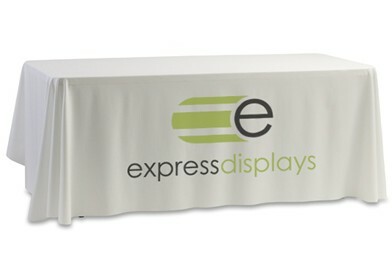 Our durable white tablecloths are the perfect way to complete your display. Our special print process means that your logo is printed deep into the fabric so it will not crack or fade like a transfer print, is fully washable and can be ironed to help keep it looking great. Simply send us your logo a we’ll print it onto your tablecloth. A printed tablecloth can add a professional finish to any table top display. When using tables at events, they can often be blemished, can make a stand look unprofessional and detract away from your products or services. Adding a simple tablecloth can provide a smooth clean surface to your display while also providing an additional opportunity to brand your stand. Printed tablecloths can be used time and time again, as are fully machine washable and can be ironed to make sure that they stay in tip-top shape.